Driving into work on Thursday, The Donnas came up on my playlist and I was immediately whisked back to a particular moment in time. This was the song I was listening to a few months ago when my Z3 got run over by an SUV. I was listening to their track titled, “Take It Off,” and thinking to myself that if Carsen Taite’s character, Luca Bennett, had a theme song, this would be it. I’m on my second drink, but I’ve had a few before… I’m tryin’ hard to think and I think that I want you on the floor. It was at about that moment that the airbag deployed. Luca’s favorite lunch is a burger and a beer, and she drives a vintage Bronco, so I’m pretty sure she’d be into The Donnas. Anyone who eats that much red meat and drives a V8 would definitely have this song on her favorites list. Jill tries to present a tough exterior, but inside she just wants to be held. She has a tendency to push people away, which is the opposite of what she really wants: Intimacy. Yeah, I’m reaching back in the archive a bit for this one. But Zak spends time off the grid executing undercover ops so I’m thinking her playlist might lean toward classic rock and vintage favorites. 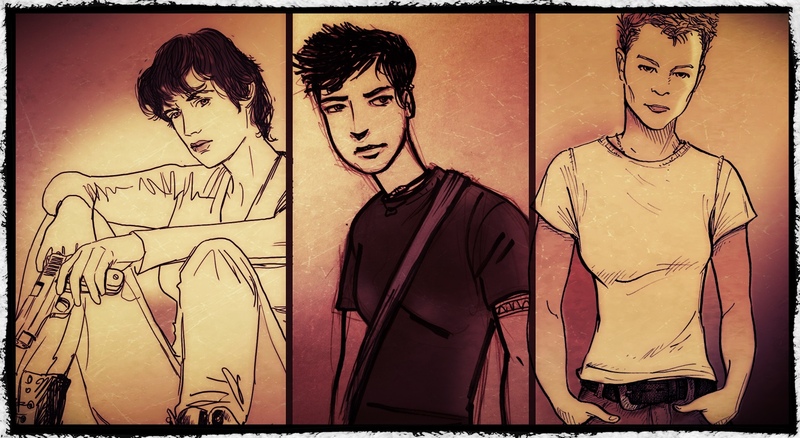 From left to right: My drawings of Luca, Zak, and Jill. The next two characters that I’m going to mention I don’t have drawings for. Yet. Sam has a tendency to spiral into dark places. She gets down on herself. She thinks she’s terrible at relationships, but she really isn’t. The last breakup she suffered was like a gut punch to her self-esteem. An improbable barter deal involving a hope chest and dinners for a month places the lovely Jessica Walker distractingly in the way of Sam Casey’s bachelor lifestyle. Music matters. At least it does to me anyway, so much so that I’ve built a playlist for writing. I end up doing a lot of my writing during the in-between spaces in my life; at coffee shops, during lunch breaks, late at night. I put the headphones on and two songs into this playlist I’m in the zone. It’s a list of about 40 songs that I listen to over and over and over, to the point where I cease to hear the lyrics and instead allow the music to transport me to a particular place and time. As I’ve listened to this playlist and adjusted the mix, certain songs have begun to identify themselves with specific characters. It’s almost like having a soundtrack for a movie and within that, each character’s theme song. Love your process, M. Wish I could combine music and writing because I love both, but the tunes distract me and I end up singing or dancing instead of writing. You certainly nailed my Zak character in Fever. Thanks again for making her come to life with your art and thanks for the shout-out We both appreciate it. Fever was a great read. I remember Evelyn wanted me to get ready to leave for something, I was sitting in the back yard reading your book… she was like, what are you doing? We need to leave… and I was like, I’m in the middle of a lion attack! And since she didn’t know I was reading a book, she said, What! What lion?? It was a funny scene. Great process, M. Wish I could combine music and words because I love both, but I just end up singing or dancing instead of writing. You definitely nailed my Zak character from Fever. Thanks for bringing her to life with your art and for the shout-out. Missouri Vaun (aka Paige Braddock the artist/writer behind Jane’s World) gives one of my books a shout out in her blog about playlists for writing. Her first novel, “All Things Rise” that’s not a graphic novel comes out in May. I can’t wait. maybe this will just be the first chapter.